There are a lot of pioneers who are willing to go to the new frontier and start to edge into it. I think we’re going to get there. What I care about is not whether it happens in the next year, but that we’re on a clear trajectory to make it happen. It’s about communication and managing change, and it has to be localized. You cannot take what works in downtown New York City to rural Georgia. If they don’t think alike, if they don’t operate at the same speed, it’s not going to work. CIOs have emerged as critical leaders in our organizations because they’ve been able to translate the use of technology and data into enabling the mission and vision of the organization. They’ve become critical players, creating toolkits and leveraging technology to determine where data can take us. You need to be able to explain why you need something, what the benefit is, and how you might be able to provide it. I’m not interested in geek speak; I’m interested in coming up with better ways to communicate. Gamble: When you talk about the goal of reducing the amount of time it takes to bring research into practice, I imagine it has to be tackled in small bites. Seventeen years is a huge gap, and it’s going to take time to close it. Johnson: I agree. When I think about the strides we’ve made as a nation with sepsis, it’s because we didn’t try to take on sepsis, stroke, and cancer at the same time. We’re taking them on in pieces and focusing on them individually. If you look at breast cancer survival rates, they’re remarkably better than they were 10 or 20 years ago. We need to choose the areas where we know we have reliable data, and start to show that incremental change can have great benefit. Then we keep testing the hypothesis and seeing which protocols worked and which ones didn’t, and make changes. Let’s not wait 17 years. Let’s make it this year. And these are conservative changes, not radical changes. This is not a research study. This is about trying to provide better care faster. Obviously, I’m very passionate about it, because it’s very real for us. There are a lot of pioneers who are willing to go to the new frontier and start to edge into it. I think we’re going to get there. What I care about is not whether it happens in the next year, but that we’re on a clear trajectory to make it happen. Gamble: Right. So looking at your role, I imagine one of the challenges lies in dealing with markets that are so different. What works well in one area might not in another — how do you address that as CIO? Johnson: That’s an accurate observation. We do a number of things. We have a clinical informatics program where we work closely with our partners in operations to evaluate readiness for change. We put change agents at the local level, whether it’s a clinical informaticist, medical director of informatics, chief nursing officer or regional nursing officer, or chief medical officer — people who can help lead change and communicate in a way that is accessible in that market. It’s about communication and managing change, and it has to be localized. You cannot take what works in downtown New York City to rural Georgia. If they don’t think alike, if they don’t operate at the same speed, it’s not going to work. You have to take culture into consideration, and you have to find leaders in that culture that will help you take up the banner. We can’t just bring in — and I hate this term — corporate people, because if we’re not walking in their shoes, doing the work they do every day, dealing with local politics, and knowing the diseases they’re dealing with at a higher concentration in that market, then it just doesn’t work. I can come into town and talk about a hotshot program for a disease that’s really prevalent in the Southeast, but if we’re talking to hospitals in Northern California, I need to know that it may not be a high priority for them. We have to be able to customize. Sepsis is pretty universal, unfortunately, but something like hypertension or diabetes might be a big issue in one community, while another is dealing more with infectious disease issues related to environmental conditions. Is it a perfect science? No. Do we pay attention to it? Yes. And language is important — are you speaking the language that patients use every day? When there are 25 dialects to a particular language, we have to make sure what we’re saying is being translated into something they understand, both from a content perspective and from a language perspective. So there are a lot of challenges, and one size doesn’t fit all. Now, if you’re talking about something like sepsis, we follow evidence-based practices. If a patient has all the signs, I’m confident that the interventions we can do will be equally effective, whether you live in rural Georgia or you live in Upstate New York. It’s just about translating it to a way they understand it. Gamble: It’s all about culture. Now, when you talk about all of the things are that top of mind for you, it’s clear how much the CIO role has evolved. In what way do you feel the role has changed the most? Johnson: Years ago, CIOs were the data center leaders. It was a technology-driven job where you had to have enormous and deep knowledge of technology, whether it was how a data diagram worked or how a network structure was put together, etc. I think what has happened is CIOs have emerged as critical leaders in our organizations because they’ve been able to translate the use of technology and data into enabling the mission and vision of the organization. They’ve become critical players, creating toolkits and leveraging technology to determine where data can take us, and whether it’s the right direction. It’s a very different focus. They’re at the big kid table now, sitting with the CEOs helping to guide the future. Based on that, I think it’s critical that CIOs understand and maintain current knowledge of what’s going on in the technology industry, because it’s so dynamic. There’s nothing static about the technologies we work with. But if you can stay up with the changes that are coming — where the administration is going, where policy leaders are going — and combine that with your own collective knowledge of all those things and how they might advance care, you can then translate that into better outcomes. 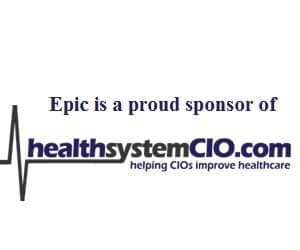 It’s not about just acquiring and maintaining EHRs and revenue systems. It’s about really taking advantage of where we need to go. I believe CIOs today have to gain new knowledge around cybersecurity and interoperability. We’ve been involved in interfaces and privacy for years, going back to when HIPAA first became part of our landscape, but that’s evolved enormously. I think most organizations look to their CIO to ensure a safe environment from a cybersecurity perspective — to really own that. That’s new knowledge that we need to bring. Gamble: Along those same lines, what are some of the qualities you believe CIOs will need to have going forward? Johnson: You really need to be on a constant recognizance around the new technologies, and you have to go even beyond that. I think you have to dream a little, and imagine a little — that is, if you can sit back from the 120 exciting projects on your plate today — and think about what technology could do. You need to eliminate the ceiling and the walls and imagine what technology can really do, and communicate that to our partners. If you can do that, then you can really start thinking about value-based care and reimbursement initiatives and all those things that are coming our way, and how can we be ready for that — not just to capture the data, but really to be able to have the system in place to improve the value and ensure that we can show outcomes. What’s also important — and this is something I talk about when I teach CIO Boot Camp — is being able to tell the story. By that, I mean you need to be able to explain why you need something, what the benefit is, and how you might be able to provide it. I’m not interested in geek speak; I’m interested in coming up with better ways to communicate. For example, if you’re trying to do something with antibiotics, they don’t need the 14-syllable name of the microorganism you’re fighting; they want to know that if patients are given a certain drug, they can go home and return to their life as they know it. Just be able to tell the story is so important, especially if they are personal stories. I think CIOs in the future will need to be able to avoid geek speak and tell stories about how and what we do will make a difference. Gamble: Right. When you talk about telling the story, I imagine that could be applied to speaking with the board or doing advocacy work. Johnson: Absolutely. I’ve been involved in advocacy since I was in nursing school 40 years ago when I spoke about the role of a nurse, and that led to going to the Hill and talking to Congress. Obviously the agenda changes, just as the legislator agenda changes. You look at the world you’re in and you translate it into why we want or don’t want something to happen in legislation, in the Senate, or with our state and federal representatives — even the regulatory bodies or associations for clinical areas like nursing or surgeons. You need to speak your voice.